Serra Frank has been wearing her Safer Shirt for a long time. 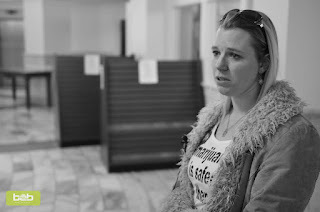 Recently she was a part of a protest in Idaho hoping to bring attention to laws against medical cannabis. She has interstitial cystitis which causes a lot of pain. Doctors gave her various options including pills which she tried, they didn't work. When she tried cannabis she found her pain went away. The state of Idaho will not allow Serra to use medical cannabis. 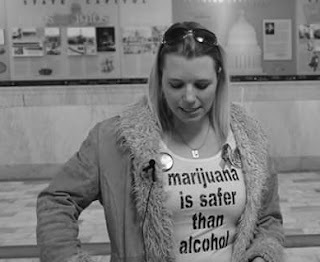 She planned on smoking a joint in front of Idaho lawmakers as part of the protest at the capitol but she was arrested before she could light up. The folks who planned the cannabis protest contacted the police in advance to let them know it was gonna happen. "She can get up to a year in jail or a thousand dollar fine," Idaho State Police Lt. Brad Doty said. Serra Frank gave a speech while passersby and supporters watched. "For all of our future generations and for each and every one of you and your families, I stand here today in front of my Capitol building obligated by conscience to demand the reform of Idaho's outdated and harmful marijuana laws, and willfully and civilly disobey," Frank said. "I want the end of cannabis prohibition and a better future for our children," Frank announced. "We're doing this because it's time to talk about this," Frank added. "Why are we arresting our parents, people who are sick?" After living in Oregon and Washington and seeing the way patients benefited from the medical marijuana systems there Serra is encouraging lawmakers in Idaho to treat marijuana in a manner similar to its neighbor states on the west coast. Serra is running a GoFundMe campaign so she can get a Lawyer for a case she is going through in Idaho right now. Click Here for more information. Where are these leaders of this so called free world?